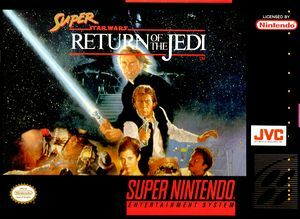 Join the Rebellion and crush the Death Star in Super Star Wars: Return of the Jedi, a giant 16-meg universe filled with all the action and adventure of the Star Wars® finale. The command of five different characters–from Wicket the Ewok to Princess Leia–and go up against the Empire's worst, from Jabba the Hutt to the Emperor himself! This is it! You're going to need every ounce of Force you're got in you. The graph below charts the compatibility with Super Star Wars: Return of the Jedi since Dolphin's 2.0 release, listing revisions only where a compatibility change occurred.